The Earth's largest living land animal was a 26,000-pound dinosaur, the biggest ever discovered was found in South Africa and is even larger than the previous record-holder, the brontosaurus. Researchers say the newly discovered species was related to the brontosaurus and lived about 200 million years ago. The 26,000-pound land animal has been dubbed the "Ledumahadi mafube" whose name means "a giant thunderclap at dawn" in Sesotho. Sesotho is the official South African language indigenous to the region where the dinosaur was discovered. Jonah Choiniere, a paleontology professor at the University of the Witwatersrand in Johannesburg, South Africa said, "The name reflects the great size of the animal as well as the fact that its lineage appeared at the origins of sauropod dinosaurs. It honors both the recent and ancient heritage of southern Africa." Although the dinosaur is massive in size, roughly as large as two African elephants combined, and very similar to its relative the brontosaurus, there are other evolutionary advantages the species possessed which made it a unique species. The study which was authored by Choiniere was published Thursday in the journal Current Biology. "It shows us that even as far back as 200 million years ago, these animals had already become the largest vertebrates to ever walk the Earth," said Choiniere whose graduate student Blair McPhee discovered the bones of an unknown dinosaur herself in 2012. "Blair told me how important he thought it was, and even showed me that some of its bones were still sticking out of the rocks in the field," Choiniere said. The excavation of the bones took years as the team worked to uncover the fossil of a fully-grown adult dinosaur which was likely about 14-years-old when it died. Ledumahadi was closely related to sauropod dinosaurs, like the brontosaurus and others that ate exclusively plants and walked on four legs. The Ledumahadi's fossil's show that it evolved earlier and independently of sauropods. Sauropods are recognizable for their posture and thick, column-like limbs that are similar to those of elephants except they evolved from ancestors that primarily walked on two legs. Making the change through evolution to walk on all fours allowed sauropods to grow larger. It also helped support the digestive process needed to eat a herbivore diet. Choiniere and her team of researchers say that Ledumahadi was likely a transitional dinosaur, sort of like an evolutionary experiment during the Early Jurassic period which unique features such as their forelimbs which are more "crouched" yet still very thick and strong enough to support its giant body. The study's lead author, McPhee said, "The first thing that struck me about this animal is the incredible robustness of the limb bones. It was of similar size to the gigantic sauropod dinosaurs, but whereas the arms and legs of those animals are typically quite slender, Ledumahadi’s are incredibly thick." McPhee and Choiniere wanted to find out whether or not the Ledumahadi walked on two or four legs so they developed a way to test it. By compiling data of dinosaurs, animals, and reptiles that walked on two or four legs, including attributes such as leg measurements and thickness, they compared the data from the fossil with the dataset which helped them determine Ledumahadi's posture. The method also helped reveal that the Ledumahadi walked on four legs and other early similar dinosaurs were also experimenting with walking on all four legs. The evolution of sauropods isn’t quite as straightforward as we once thought," Choiniere said. "It appears that sauropodomorphs evolved four-legged postures at least twice before they gained the ability to walk with upright limbs, which undoubtedly helped make them so successful in an evolutionary sense." The dinosaur is also a relative of giant dinos that lived during the same time period in Argentina. This supports the idea that all of the continents were still assembled Pangea, one massive supercontinent that made up most of Earth's land mass in the Early Jurassic. "It shows how easily dinosaurs could have walked from Johannesburg to Buenos Aires at that time," Choiniere added. When the Ledumahadi roamed the land 200 million years ago in South Africa's Free State Providence, the region looked very different than it does today. Back then, it would have been flat and semi-arid land with shallow streams that were always drying up. 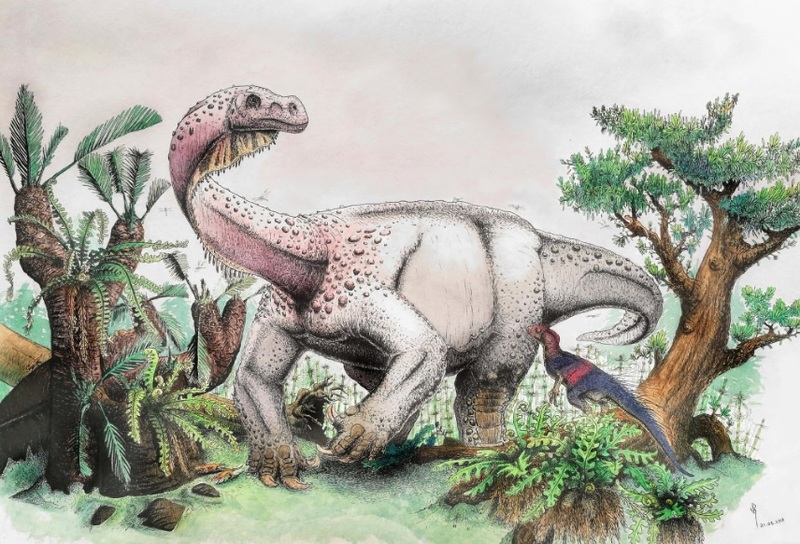 "There was a thriving dinosaur ecosystem here in South Africa, at the bottom of the world, featuring 12-ton giants like Ledumahadi, tiny carnivores like Megapnosaurus, the earliest mammals, some of the earliest turtles, and many, many others," Choiniere said. South Africa’s Minister of Science and Technology Mmamoloko Kubayi-Ngubane said, "Not only does our country hold the Cradle of Humankind, but we also have fossils that help us understand the rise of the gigantic dinosaurs. This is another example of South Africa taking the high road and making scientific breakthroughs of international significance on the basis of its geographic advantage, as it does in astronomy, marine, and polar research, indigenous knowledge, and biodiversity."